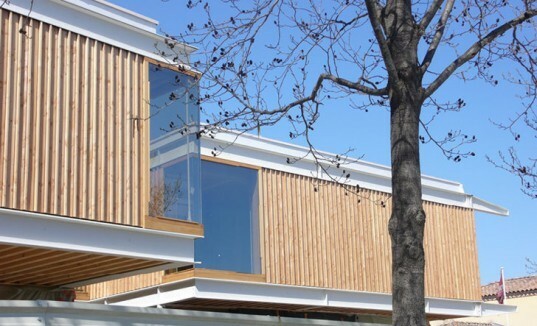 The Jean Carrière Nursery School, designed by Tectoniques and Atelier GA, has received the "label Or" (Gold Label) certification of the Bâtiments Durables Méditerranéens association for sustainable buildings. This school located in the town of Nimes in the south of France operates on a highly efficient level thanks to passive building techniques that adapt to the climate in Nimes. This building is yet another innovation provided by these two European firms, who consistently produce buildings designed to the highest levels of sustainability. Tectoniques and Atelier GA began designing the Jean Carrière Nursery School by analyzing the site. 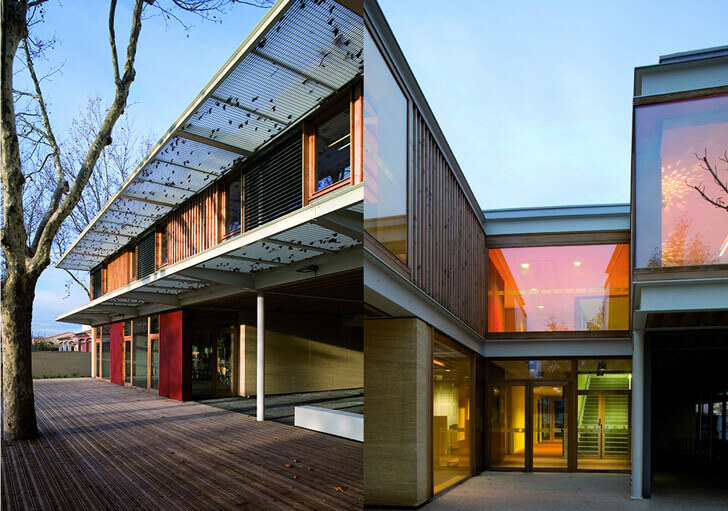 Constructed around the framework of existing large plane trees, the school is arranged to create a campus that remains light on the site. The existing trees were preserved, the foundations of the buildings remained small, and a retention pond on the site helps to mitigate natural flooding. The design of the project responds to the need set a small foundation on a site that was problematic due to flooding. Thus the building seems to float above the ground, hovering around the roof heights of the surrounding neighborhood. Cantilevering the second floor rooms helped to increase the program square footage and create shaded spaces in the exterior corridors. The building plan resembles a cross-shape, which ultimately helps provide supervisory observation of the children. Walls throughout the building are glazed to provide extra observation and security. The Jean Carrière building meets low energy consumption standards and it has received BBC-Effinergie certification. The design includes passive ventilation, natural sun shading from the trees, and wonderful eco-friendly interior materiality. The design team’s respect and attention to the existing landscape is a welcomed gesture at understanding that active, sustainable design grows from a deep respect and appreciation for nature. The design of the buildings was a reaction from the need to thave the building's foundations small on a site that was problematic due to flooding. Thus the building seems to float above the ground, hovering around the roof heights of the surrounding neighborhood. The building plan resembles a cross-shape, which ultimately helps provide supervisory observation of the children. Walls throughout the building are glazed to provide extra observation and security. The design teamed began their sustainably focused design by analyzing the site. Constructed around the framework of existing large plane trees, the school is arranged to create a campus that remains lite on the site. The design teams respect and attention to the existing landscape is a welcomed gesture at understanding that active sustainable design spurs from a deep respect and appreciation for nature. Cantilevering the second floor rooms helped to increase the program square footage and create shaded spaces in the exterior corridors. The building interiors are flooded with daylight, which helps to keep energy consumption through lighting to a minimum. The classrooms are fun and playful with Eco-friendly materials and plenty of glazing to help keep visibility and observation of the children a priority.